Director's Dish: IT IS Rally Time! On Friday night I felt as threadbare as our hotel room. Like a build-a-bear pulling apart at the seams- stuffing coming out everywhere. It was 11 pm, I'd spent the better part of the night at Wal-Mart tire center, there was no heat, I was on day 13 of a 14-day work week, and of those 13 days, 11 of which I was up before 5:30 (which is early for me!). Over the past two months I am down a toenail, worked all but 5 days, spent more nights in hotels than in my own bed, singed a large portion of my hair, lost a cell phone, recovered said cell phone from I-64 (well W did actually), lost a computer & make-up bag, found computer and makeup bag, logged 3,000 miles driving and 15 running, 1 flat tire, eaten more fast food than Morgan Spurlock, I look like wolf-boy - since I haven't waxed my eyebrows, my roots are at least 2", nearly threw away a credit card, tracking Walk goals and numbers, innumerable meetings and at least 20 presentations... The thought of the impending 5 a.m. wake-up call, felt like an elephant standing on top of my chest. But, as all of life does - it came. We groggily arrived at Wheeling Park at 6:30 a.m. Instantly, an intense flood of love and joy washed the elephant away. The storm inside me, replaced, literally, by a rainbow of hope. This is the moment, these are the hours that make it all worth it - that make me love every mile traveled - every early morning and every late night. To be a part of providing a place for people to take their anger and grief, love and pain - to come together to honor, remember and celebrate. To have a place to fight a disease that robs us of everything. To fight for a better future, a future without Alzheimer's disease - protecting our children and grandchildren. For a few hours each year, we are one big family - sharing our struggles, our moments of joy. The hugs, team pictures, promise garden, donuts, frosty mornings, registration, volunteers, tears, laughter, COFFEE - all of it. But unlike most moments, these are not fleeting. There is an underlying current of electricity that connects all of the Walks across the state and nation together. It is our building momentum against Alzheimer's disease & dementia - this momentum carries us through the entire year. We carry that power with us, spreading the word and growing the cause. So in those moments we are threadbare, worn down by this insidious disease - I rely on Joe, and Ann, and Keely, and Carol, and Becky, and Debbie, and Molly all of these powerful people and powerful moments from Walk to keep the power on in me. For that, I thank you. IT IS RALLY TIME!!! Charleston Walk to End Alzheimer's is in 2 weeks!! We are not leaving a stone un-turned. BUT we need your HELP!! We have posters, wickets, postcards - share us via email, facebook, twitter (soon instagram)! Every person registered, every penny raised pushes our mission forward! Help us get to $140,000!! TUNE INTO V100 Tuesday morning to catch me on the Steve & Jenny Show at 8:20 a.m.! They are not only great media sponsors - they are great partners in our cause!! Stay tuned to our Facebook page for Walk promotions all week - your chance to win great prizes and help us promote Walk to End Alzheimer's! Bank Day E-Z PASS! Be sure to join us on Bank Day to not only pick up your team's t-shirts, but pick up event-day wrist bands so you and your team members can BYPASS registration and head straight to the Walk Day Action!! If you are walking in honor or memory of someone, add their photo to our Why We Walk slide show that plays at the ballpark. Email your photo to wvinfo@alz.org. Each year this moving tribute continues to grow and inspire us to reach farther. Living with Alzheimer's Tent, this year at the Charleston Walk to End Alzheimer's we will be hosting a Living with Alzheimer's Tent, a special place for individuals with Alzheimer's to stop by, or take a rest from the action. If you would like more information, email wvinfo@alz.org or call 800.272.3900. Living With Alzheimer's education program for people in the early stages of Alzheimer's or dementia and their caregivers will start in November. Click here for more information. Research News: Last week there was a lot of media surrounding research released regarding a compound that stopped cell death in mice with prion disease. Every research lead that opens up, needs to be pursued - however, there is a lot more research that needs to happen between mouse studies and human studies. Watch Dr. Maria Carillo, Alzheimer's Association Vice President of Medical and Scientific Affairs, on CNN talk about these research findings. This time of year we all end up coming down with the crud. Scratchy throat, ear ache, sinus pain - just a part of the change of the season I suppose. But nothing makes you feel better than a little homemade soup. 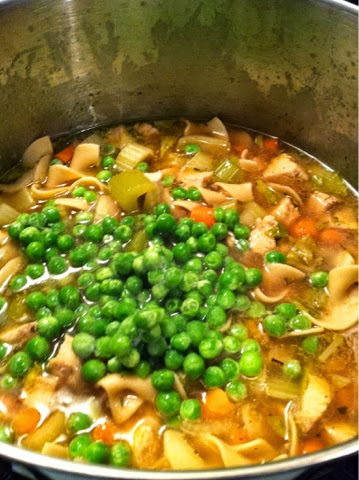 This soup is a piece of cake, the ingredients are interchangeable depending on what you have on hand. This recipe made enough for W and me, plus 3-4 bowls of leftovers. 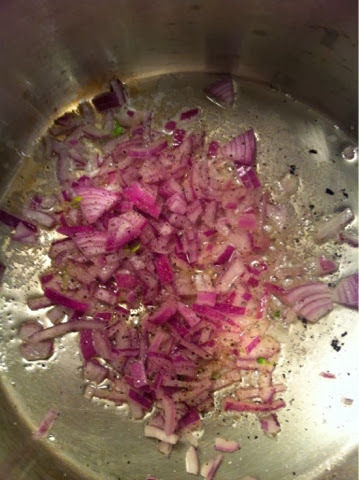 I only had red onion on hand - while not ideal, it actually turned our to be really tasty. I used about 1/2 of the onion. Throw into a pan over medium heat, with olive oil and 1 tbs of butter. 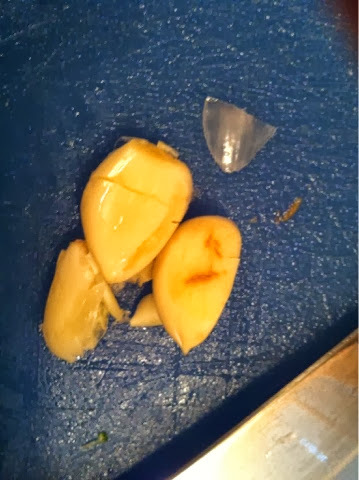 Chop the garlic! I like at least three cloves, more or less depending on taste. 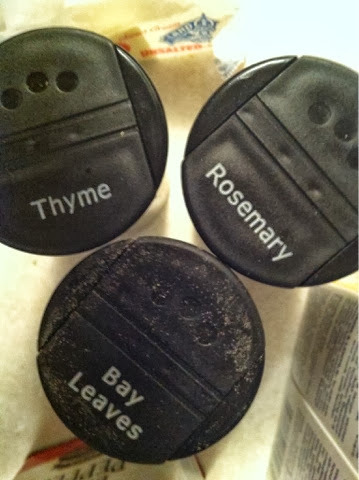 Pull out of your cabinet some core spices. 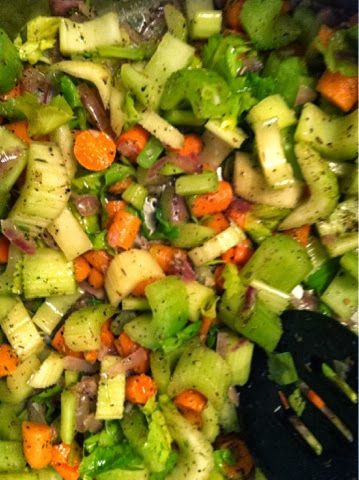 I like this com I action for a hearty fall soup! 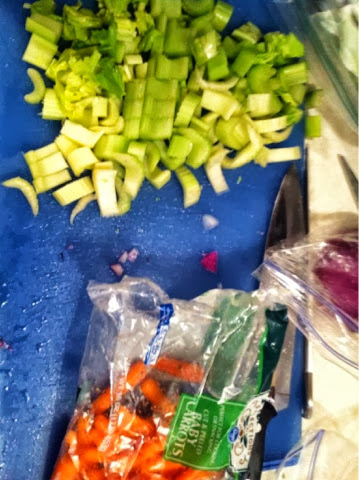 Add the veggies and garlic followed by seasonings to the pot with onions. Let the veggies sweat, but you don't want them to cook all the way through. Finally add a pinch of salt and 1/2 tbs of pepper. 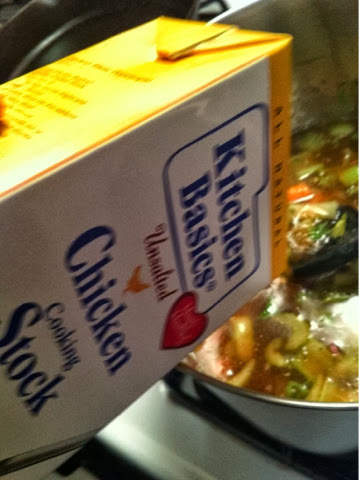 Add 1 boc of unsalted chicken stock - depending on how soupy you like your chicken noodle - add 1/2 carton - 1 full carton of water. 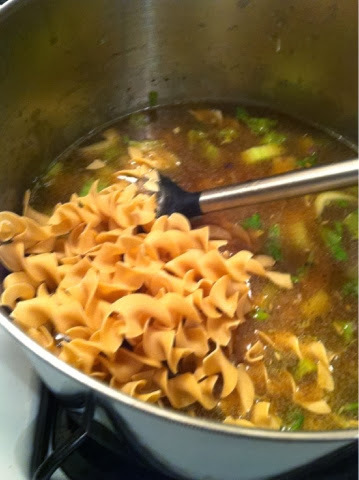 Bring the ingredients up to a simmer and add 2-3 cups of your favorite noodles. Your chicken should be done about this time - make sure to let it cool for a few so you don't burn yourself. 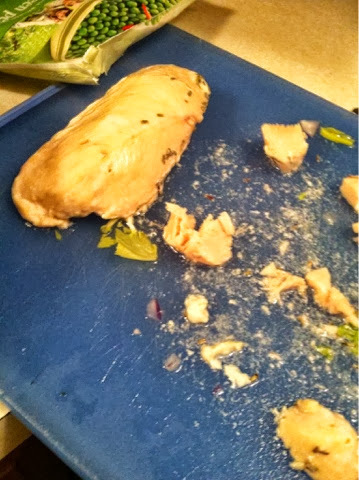 Cut chicken up into small pieces then add to the soup. I was so hungry, I forgot to take a final picture!